Chain link fences need to be built with the strongest and most durable materials to keep you protected and safe. Along with this, they need to be expertly installed in order to withstand time and any outside forces. To guarantee strength and satisfaction, Rustic Fence has mastered the art of chain link fences to ensure a lifetime of protection. Since 1964, Rustic Fence has been crafting and installing high-quality chain link fences in Arlington, TX and the surrounding areas. The South family has owned and operated the company for over 50 years, and crafting perfect fences has always been the number one goal. At Rustic Fence, we understand the importance of trusting your fence and contractors. 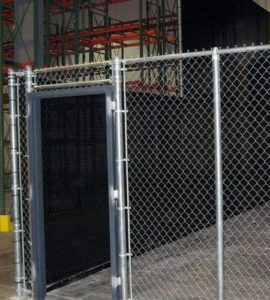 Whether you need a chain link fence for your home’s yard, a maximum-security prison, or anything in between, we guarantee that you will be satisfied with our durable and long-lasting products. 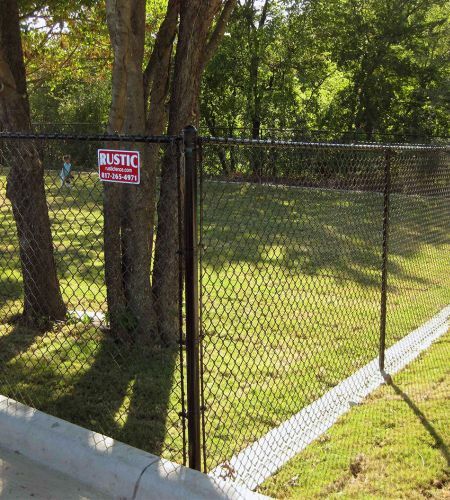 Our chain link fences are made from the highest grade materials and are professionally installed so that you can rest assured that you are protected. We understand that your safety and peace of mind is of the utmost importance, and our guarantee is there to give you constant reassurance of our services. With over 50 years of serving satisfied customers in Arlington, TX and surrounding areas, we know that you will love our fences as much as we do! containment enclosures. Whether you need a fence to enclose an entire room, area, or simply around certain machines, we have the tools to get it done! All of our fences are expertly installed and secured so that you don’t have to worry about future compromises or external damage. Our long-term warranty gives you the peace of mind needed to fulfill your duties without the stress of worrying about safety. Leaving air conditioners or other machines out in the open puts you and your business at risk. To keep workers or civilians away, you can utilize a chain link cage to limit the access. Cages also work to keep thieves and vandals away from your prized property so that you can effectively run your business. To see how we can help you, contact Rustic Fence today for more information! (817) 275-2151 or (972) 725-7984.